Chicken and Spinach Stuffed Shells made with cooked chicken, spinach, cottage cheese, mozzarella, and topped off with a homemade red sauce. Combine the shredded chicken, chopped spinach, cottage cheese, mozzarella, Italian seasoning, salt, and pepper together and set aside. Cook the pasta per the direction on the box. Once they are cooked rinse with cold water and cool. While the pasta is cooking make the red sauce. In a skillet heat the olive oil. Add the onion, green pepper, and garlic. Cooking over medium heat cook the vegetable until they begin to soften. Add the diced tomatoes, tomato sauce, Italian seasoning, and Parmesan cheese stir until well blended. Simmer for about 5 minutes. To assemble - spread 2 1/2 cups of the red sauce on the bottom of a 9 x 13-inch pan. Fill the cooked shells with about 1 tablespoon of the chicken filling. Place the stuffed shell in the baking pan on top of the red sauce. Repeat the procedure for the rest of the shells. 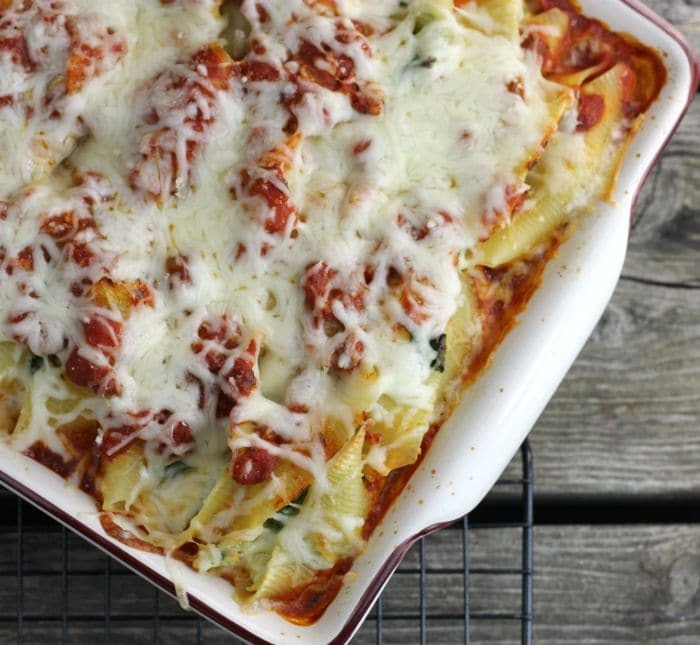 Drizzle the remaining red sauce over top of the stuffed shells. Bake in the preheated oven for 30 minutes. Remove from the oven and top with the remaining mozzarella cheese. Place back into the oven and continue to bake another 5 minutes or until cheese is melted.